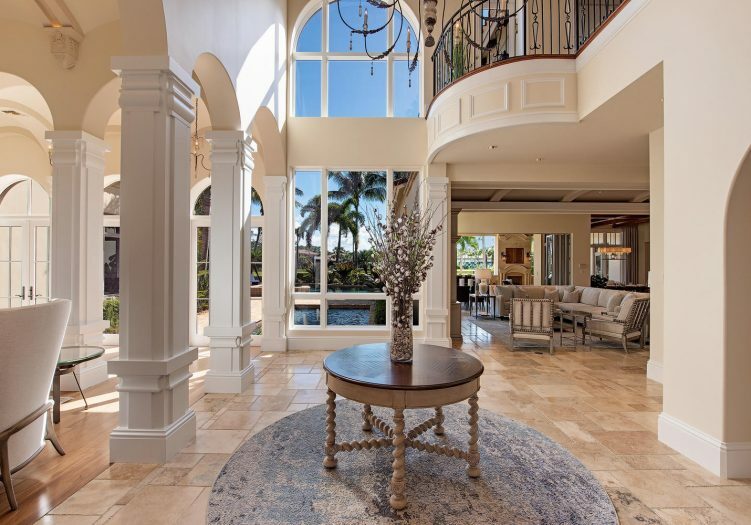 As you pass through the arched front doors into the grand foyer entry of this opulent lakeside two story estate, you are instantly captivated by the abundance of breathtaking custom architectural appointments and designer touches. 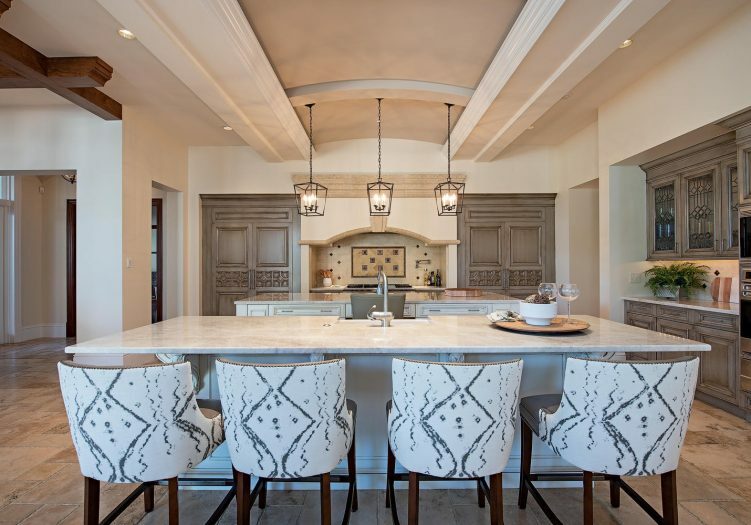 The volume ceilings are highlighted by crown molding, tray, groin and barrel design elements, applied moldings and exposed beam detail. 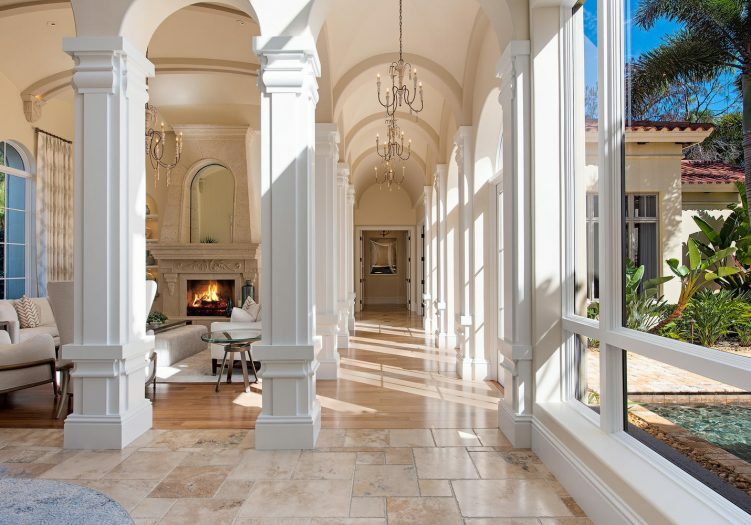 Arched passageways and thresholds, architectural niches, built in display shelving, extensive windows, gracious window treatments, a private elevator, Butler’s pantry, handsome wood flooring along with natural stone flooring throughout the main living areas inspire the luxurious atmosphere you desire. 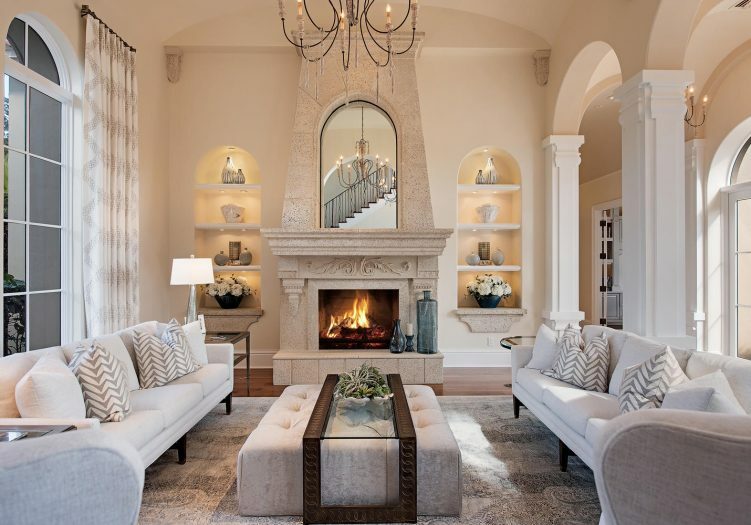 Stately wooden columns support the arched thresholds that surround and define the elegant formal living room featuring an elaborate mantel surrounding the gas fireplace creating a dramatic focal point in the room. 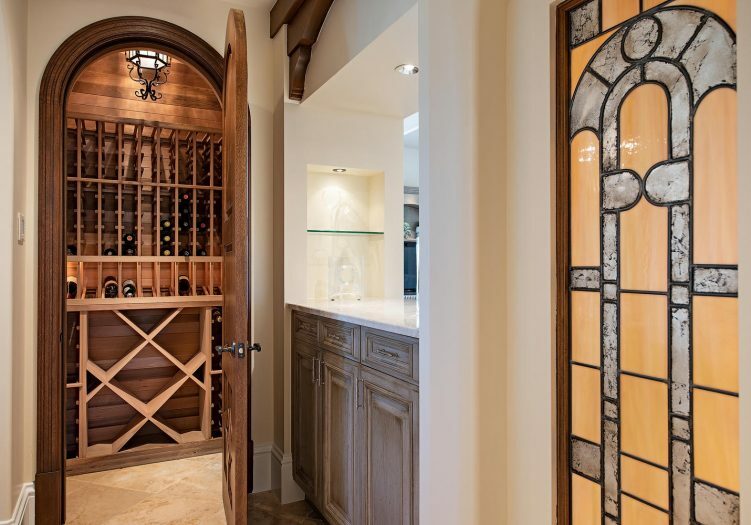 Serve special occasions meals in the tastefully decorated and appointed formal dining room with selections from the climate controlled wine room. 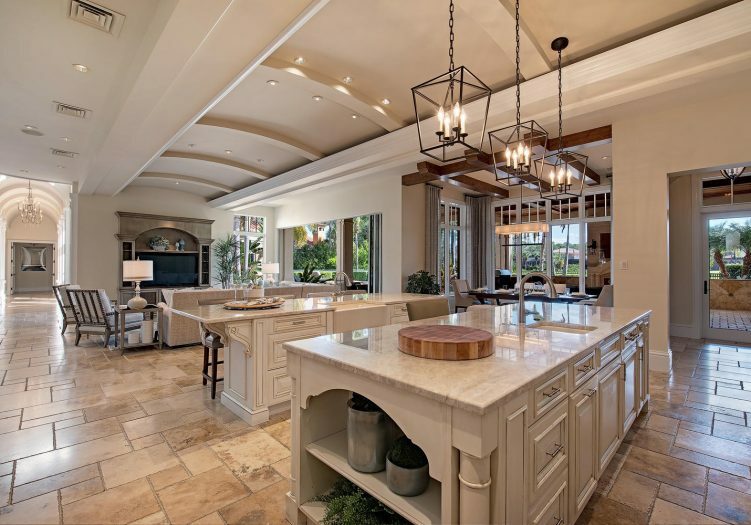 Top of the line built in appliances, an abundance of rich wood cabinetry, two floating work island stations are found in the open gourmet kitchen with an adjacent breakfast nook. 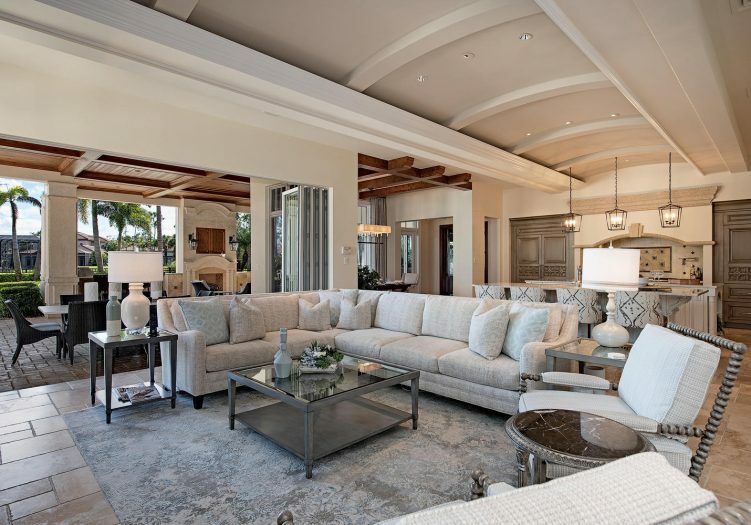 This chef’s kitchen overlooks the comfortable family room featuring a wood media center and stacking glass sliders opening to the covered loggia creating a seamless transition from indoor to outdoor casual living and entertaining. 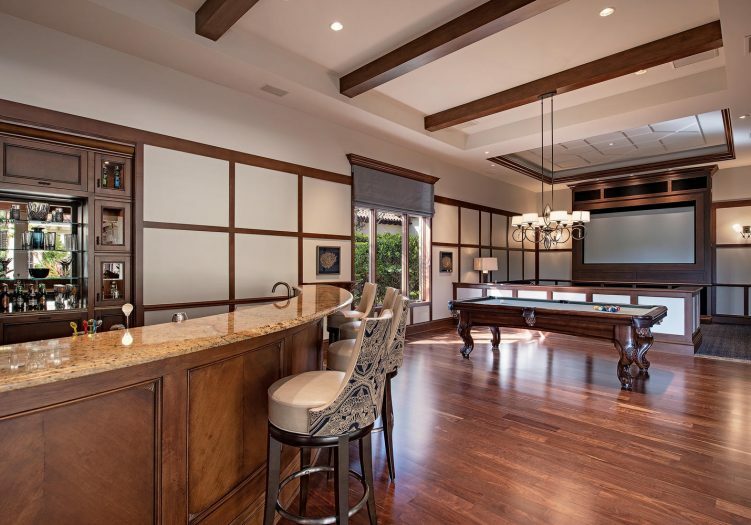 The media/game room space is complete with an impressive home theater and wet bar featuring a sink, under the counter wine cooler, storage cabinetry, display shelving and granite counter tops. 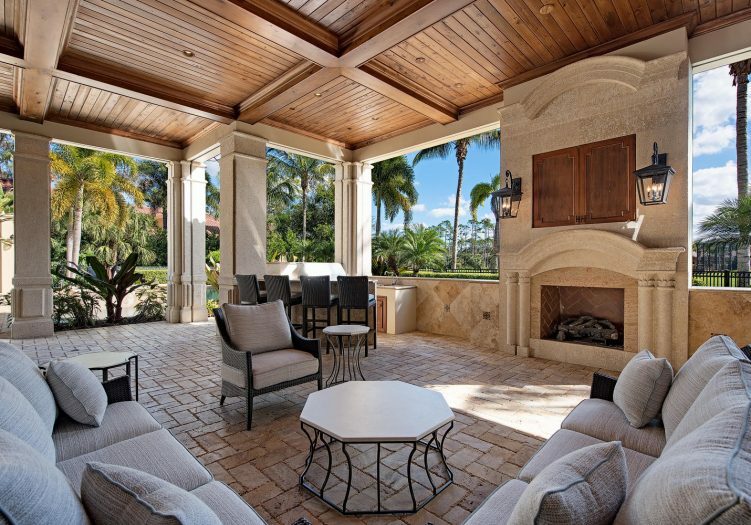 Stacking glass sliding doors open to the covered loggia boasting a summer kitchen with built in gas grill and bar seating alongside the gas fireplace gathering area creating infinite entertaining possibilities. 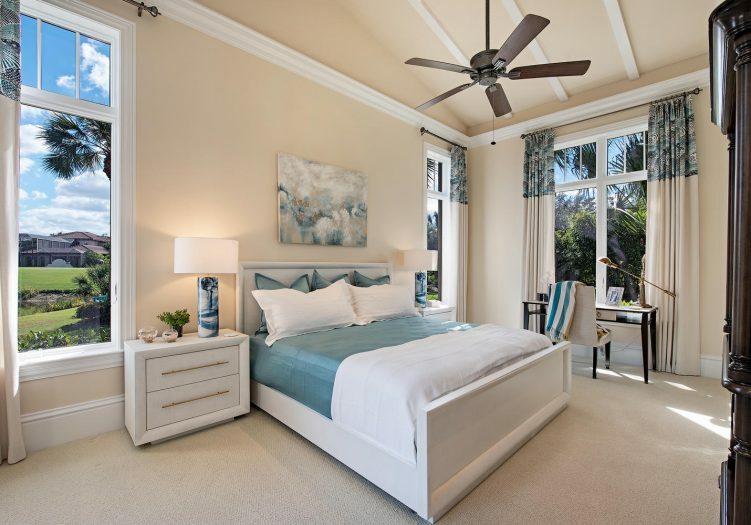 Retreat to the main floor master bedroom suite featuring a sitting area, built in display shelving and direct outdoor access from the master bedroom. 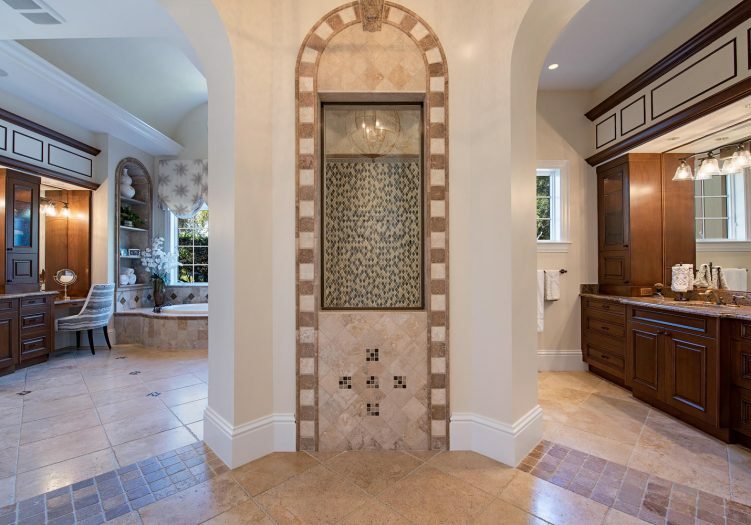 Separate his and hers vanities with custom mirrors and a lady of the residence dressing table, an enormous walk through shower and separate soaking tub are found in the spa inspired master bathroom. 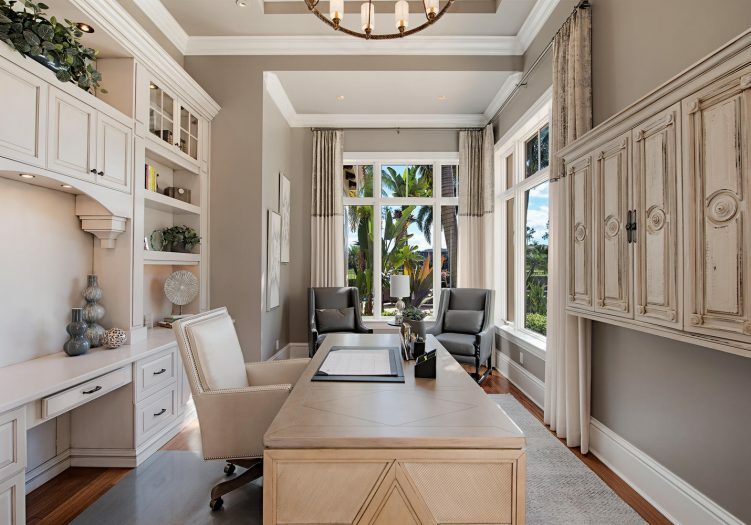 Incredible wood built-ins create handsome storage cabinetry and prestigious display shelving in the den with large windows allowing natural light to flood the space. 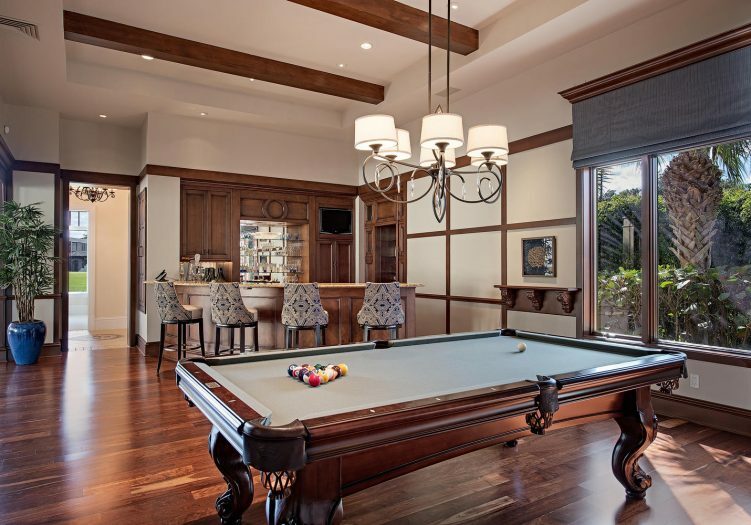 Friends and family will feel right at home in the guest suite accommodations. 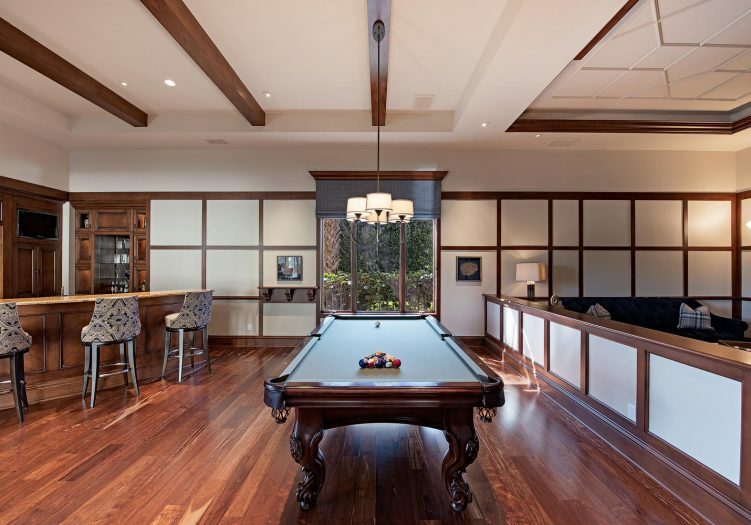 The main floor guest suite boasts private access from the outdoor living areas. 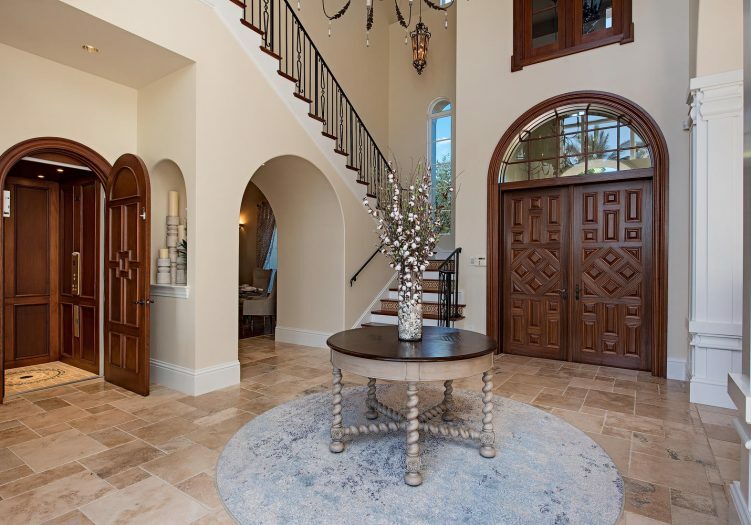 Ascend the stairway or ride the elevator up to the second story guest suites, each boasting French door access to a sunlit Juliet balcony. 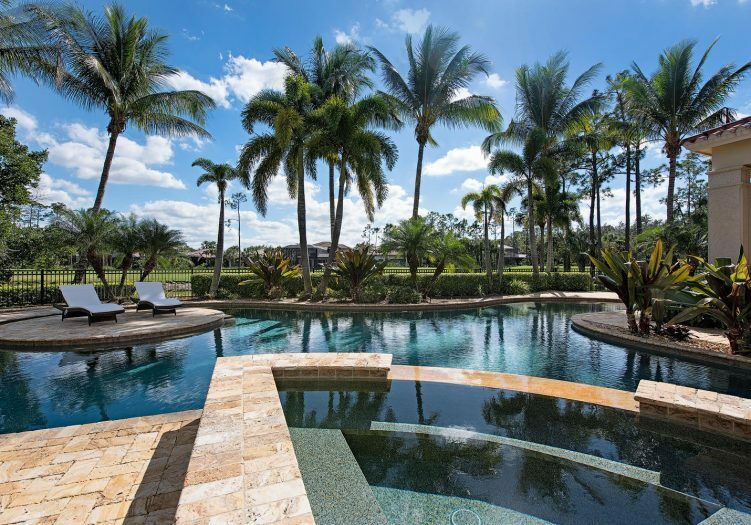 Soak up the Florida sunshine lounging on the custom stone deck flowing around the reflecting pool featuring bubbling fountains, the elevated spill over spa and shimmering pool featuring a unique sun lounging island. 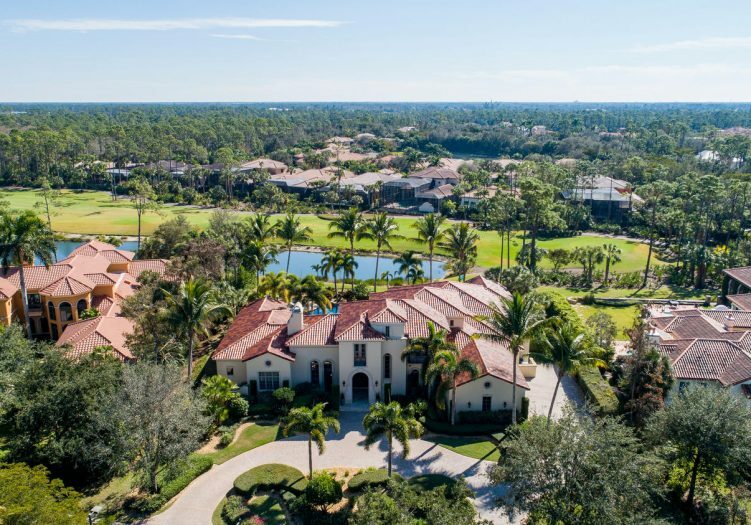 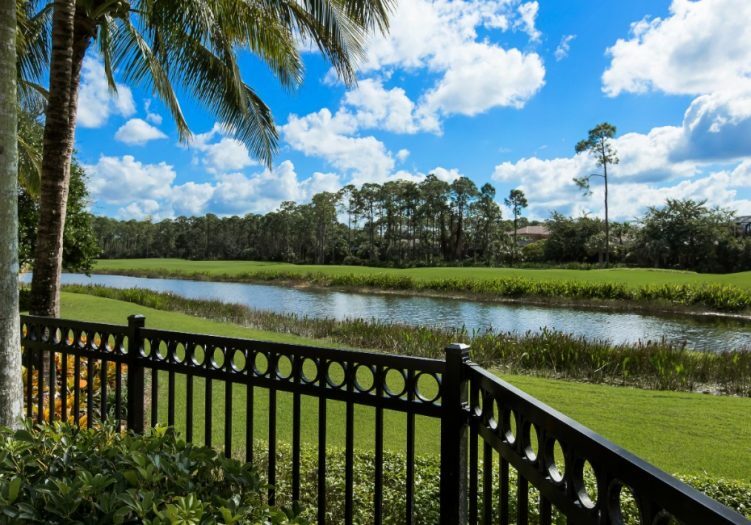 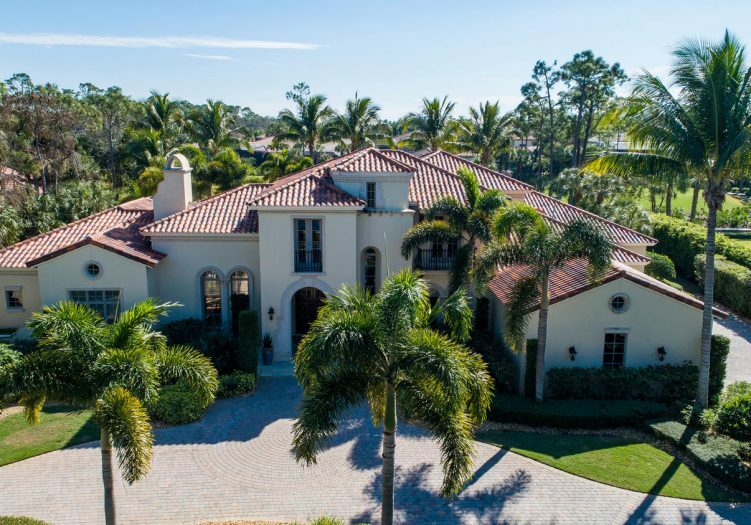 This opulent two story estate boasts all of the amenities you would expect from a home of this magnitude with south eastern sweeping golf course views as the perfect backdrop.